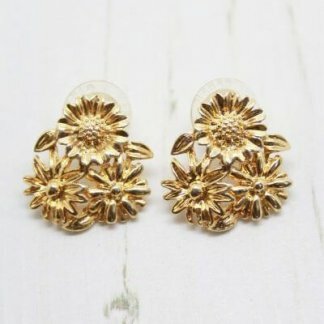 Description: A little while ago I was able to source a large collection of Sarah Coventry jewellery direct from a representative of almost 18 years. The collection included many iconic pieces, most of which have featured in books and film. The collection proved to be a time capsule of the company and changing fashion tastes alike. 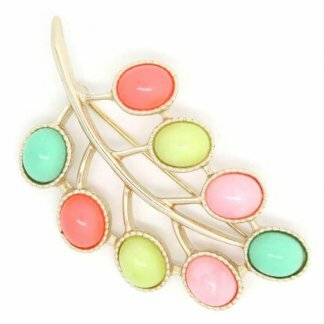 This brooch titled ‘Serenade’ is one of those pieces. 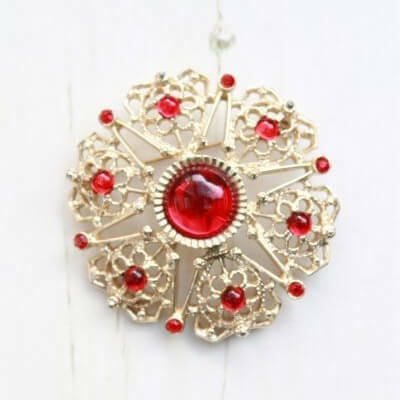 The Serenade brooch features stunning red shiny smooth stones in a gold plated large round setting. The filigree setting features a centre star surrounded by 6 flower designs. Measuring 5.5cm wide this is very much a statement brooch. Genuine vintage, fully signed to the back. In good condition showing slight to no wear. 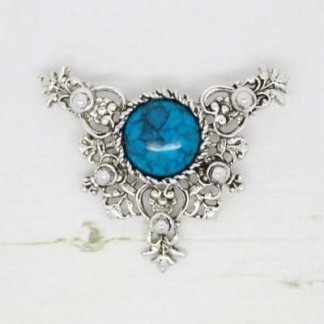 As with all Sarah Coventry jewellery this brooch has been well made and designed to be timeless. Perfect for the collector or everyday wearing.